This is a review of the StriVectin SD Advanced Intensive Concentrate. This cream is designed to help reverse the effects of aging and reduce the visibility of stretch marks. It works by promoting collagen production to help improve the appearance of skin. Continue reading to find out more about whether or not this treatment is right for you. There several man-made ingredients included in this product, which may be a concern for those who prefer a more natural approach to treating stretch marks and signs of aging. To treat signs of aging, it is recommended that this product be applied twice daily to a clean face. To treat stretch marks, simply rub into the affected area two times per day. A dosage amount is not specified. No potential side effects have been listed for this product. StriVectin is priced at $79 for 2 ounces. This makes it substantially more expensive than many other stretch mark creams on the market, and for a much smaller amount than is typically offered. A larger container is available, and is priced at $139 for 4.5 ounces. StriVectin does offer a 100% satisfaction guarantee for their product. Returns must be processed within thirty days of the order, but results are promised after only two weeks of use. In order to take advantage of the guarantee, you simply call their customer service with your order number, mail the product back, and await your refund. Shipping charges are not included in product refunds. Customer experiences with StriVectin seem to be overwhelmingly positive. Both the manufacturer website and other retailers have a large number of customers stating that this product helped fade stretch marks and improved their complexion. It was also a Fitness Magazine 2014 beauty award winner. 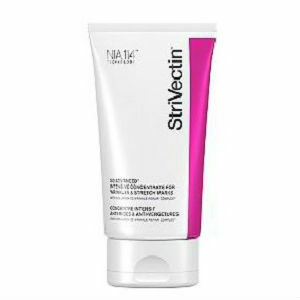 StriVectin SD Advanced Intensive Concentrate boasts a number of ingredients that serve to increase elasticity, fade stretch marks, and combat signs of aging. Customers who have tried this product seem to agree that it works as promised, and the company offers hassle free returns should you not be satisfied with your results. It is one of the more expensive creams available, which may be a concern for cost-conscious customers. It also contains several man-made ingredients, so it could not be considered a natural product, which is important to many consumers. David Carney	reviewed StriVectin SD	on July 12th	 and gave it a rating of 3.5.